Over the summer Ludosky’s petition—which acknowledged the “entirely honorable” aim of reducing pollution while offering six alternative policy suggestions, including subsidizing electric cars and encouraging employers to allow remote work—got little attention. In the fall she tried again, convincing a radio host in Seine-et-Marne to interview her if the petition garnered 1,500 signatures. She posted that challenge on her Facebook page, and the signatures arrived in less than twenty-four hours. A local news site then shared the petition on its own Facebook page, and it went viral, eventually being signed by over 1.2 million people. Éric Drouet, a thirty-three-year-old truck driver and anti-Macron militant also from Seine-et-Marne, created a Facebook event for a nationwide blockade of roads on November 17 to protest the high fuel prices. Around the same time, a fifty-one-year-old self-employed hypnotherapist named Jacline Mouraud recorded herself addressing Macron for four minutes and thirty-eight seconds and posted the video on Facebook. “You have persecuted drivers since the day you took office,” she said. “This will continue for how long?” Mouraud’s invective was viewed over six million times, and the gilets jaunes—the yellow vests, named for the high-visibility vests that French drivers are required to keep in their cars and to wear in case of emergency—were born. Even in a country where protest is a cherished ritual of public life, the violence and vitriol of the gilets jaunes movement have stunned the government. Almost immediately it outgrew the issue of the carbon taxes and the financial burden on car-reliant French people outside major cities. In a series of Saturday demonstrations that began in mid-November and have continued for three months, a previously dormant anger has erupted. Demonstrators have beaten police officers, thrown acid in the faces of journalists, and threatened the lives of government officials. There has been violence on both sides, and the European Parliament has condemned French authorities for using “flash-ball guns” against protesters, maiming and even blinding more than a few in the crowds. But the gilets jaunes have a flair for cinematic destruction. In late November they damaged parts of the Arc de Triomphe in Paris; in early January they commandeered a forklift and rammed through the heavy doors of the ministry of state—the only time in the history of the Fifth Republic that a sitting minister had to be evacuated from a government building. The gilets jaunes are more than a protest. This is a modern-day jacquerie, an emotional wildfire stoked in the provinces and directed against Paris and, most of all, the elite. French history since 1789 can be seen as a sequence of anti-elite movements, yet thegilets jaunes have no real precedent. Unlike the Paris Commune of 1871, this is a proletarian struggle devoid of utopian aspirations. Unlike the Poujadist movement of the mid-1950s—a confederation of shopkeepers likewise opposed to the “Americanization” of a “thieving and inhuman” state and similarly attracted to anti-Semitic conspiracy theories—the gilets jaunes include shopkeepers seemingly content to destroy shop windows. There is an aspect of carnival here: a delight in the subversion of norms, a deliberate embrace of the grotesque. Many have said that the gilets jaunes are merely another “populist movement,” although the term is now so broad that it is nearly meaningless. Comparisons have been made to the Britain of Brexit, the United States of Donald Trump, and especially the Italy of Cinque Stelle. But the crucial difference is that the gilets jaunes are apolitical, and militantly so. They have no official platform, no leadership hierarchy, and no reliable communications. Everyone can speak for the movement, and yet no one can. When a small faction within it fielded a list of candidates for the upcoming European parliamentary elections in May, their sharpest opposition came from within: to manygilets jaunes, the ten who had put their names forward—among them a nurse, a truck driver, and an accountant—were traitors to the cause, having dared to replicate the elite that the rest of the movement disdains. Concessions from the government have had little effect. Under mounting pressure, Macron was forced to abandon the carbon tax planned for 2019 in a solemn televised address in mid-December. He also launched the so-called grand débat, a three-month tour of rural France designed to give him a better grasp of the concerns of ordinary people. In some of these sessions, Macron has endured more than six hours of bitter criticisms from angry provincial mayors. But these gestures have quelled neither the protests nor the anger of those who remain in the movement. Performance is the point. During the early “acts,” as the weekly demonstrations are known, members refused to meet with French prime minister Édouard Philippe, on the grounds that he would not allow the encounter to be televised, and that sentiment has persisted. Perhaps the most telling thing about the gilets jaunes is the vest they wear: a symbol of car ownership, but more fundamentally a material demand to be seen. Inequality in France is less extreme than in the United States and Britain, but it is increasing. Among wealthy Western countries, the postwar French state—l’État-providence—is something of a marvel. France’s health and education systems remain almost entirely free while ranking among the best in the world. In 2017 the country’s ratio of tax revenue to gross domestic product was 46.2 percent, according to statistics from the Organization for Economic Co-operation and Development (OECD)—the highest redistribution level of any OECD country and a ratio that allows the state to fight poverty through a generous social protection system. Of that 46.2 percent, the French government allocated approximately 28 percent for social services. “The French social model is so integrated that it almost seems a natural, preexisting condition,” Alexis Spire, a sociologist of inequality at the École des Hautes Études en Sciences Sociales, told me recently. A number of the gilets jaunes I met said that despite the taxes they pay, they do not feel they benefit from any social services, since they live far from urban centers. But anyone who has ever received housing assistance, a free prescription, or sixteen weeks of paid maternity leave has benefited from the social protection system. The effect of redistribution is often invisible. And yet the rich in France have gotten much richer. Between 1983 and 2015, the vast majority of incomes in France rose by less than one percent per year, while the richest one percent of the population saw their incomes rise by 100 percent after taxes. According to World Bank statistics, the richest 20 percent now earns nearly five times as much as the bottom 20 percent. This represents a stark shift from the Trente Glorieuses, France’s thirty-year economic boom after World War II. As the economist Thomas Piketty has pointed out, between 1950 and 1983, most French incomes rose steadily by approximately 4 percent per year; the nation’s top incomes rose by only one percent. What has become painfully visible, however, is the extent of the country’s geographical fractures. Paris has always been the undisputed center of politics, culture, and commerce, but France was once also a country that cherished and protected its vibrant provincial life. This was la France profonde, a clichéd but genuinely existing France of tranquil stone villages and local boulangeries with lines around the block on Sundays. “Douce France, cher pays de mon enfance,” goes the beloved song by the crooner Charles Trenet. “Mon village, au clocher aux maisons sages.” These days, the maisons sages are vacant, and the country boulangeries are closed. The story is familiar: the arrival of large multinational megastores on the outskirts of provincial French towns and cities has threatened, and in many cases asphyxiated, local businesses.1 In the once-bustling centers of towns like Avignon, Agen, Calais, and Périgueux, there is now an eerie quiet: windows are often boarded up, and fewer and fewer people are to be found. This is the world evoked with a melancholy beauty in Nicolas Mathieu’s novel Leurs enfants après eux, which won the Prix Goncourt, France’s most prestigious literary prize, in 2018. The expansion since the 1980s of France’s high-speed rail network has meant that the country’s major cities are all well connected to Paris. But there are many small towns where the future never arrived, where abandoned nineteenth-century train stations are now merely places for teenagers to make out, monuments of the way things used to be. In these towns, cars are the only way people can get to work. I met a fifty-five-year-old truck and taxi driver named Marco Pavan in the Franche-Comté in late November. What he told me then—about how carbon taxes can seem like sneers from the Parisian elite—has stayed with me. “Ask a Parisian—for him none of this is an issue, because he doesn’t need a car,” Pavan said. “There’s no bus or train to take us anywhere. We have to have a car.” I cited that remark in a Washington Post story I filed from Besançon; in the online comments section, many attacked the movement for what they saw as a backward anti-environmentalism—missing his point. This has long been Guilluy’s battle cry, and he has focused his intellectual energy on attacking what he sees as the hypocrisy of the bobos, or bourgeois bohemians. His public debut was a short 2001 column in Libération applying that term, coined by the columnist David Brooks, to French social life. What was happening in major urban centers across the country, he wrote then, was a “ghettoization by the top of society” that excluded people like his own family. In Guilluy’s view, an immigrant working class has taken the place of the “native” working class in the banlieues on the outskirts of major cities. This native class, he argues, has been scattered throughout the country and become an “unnoticed presence” that France’s elite has “made to disappear from public consciousness” in order to consolidate its grip on power. Cities are now the exclusive preserve of the elites and their servants, and what Guilluy means by “no society” is that the visible signs of class conflict in urban daily life have vanished. This is his trompe l’oeil: rich, insulated Parisians have convinced themselves that everything is fine, while those who might say otherwise are nowhere near. “The simmering discontent of rural France has never really been taken seriously,” he writes in Twilight of the Elites. Since November, much of the French press has declared that Guilluy essentially predicted the rise of the gilets jaunes. They seem, after all, a fulfillment of his prophecy about “the betrayal of the people” by the elites, even if he is always elusive about who exactly “the people” are. While critiques from the movement have remained a confused cloud of social media invective, Guilluy has served as its de facto interpreter. For now, however, there is just one member of the elite whom the gilets jaunes wish would disappear, and calls for his violent overthrow continue even as the movement’s momentum subsides. An intense and deeply personal hatred of Macron is the only unifying cry among thegilets jaunes. Eighteen months before the uprising began, this was the man who captured the world’s imagination and who, after populist victories in Britain and the United States, had promised a French “Third Way.” Yet the Macronian romance is already over, both at home and abroad. She has a point. Among Macron’s earliest actions as president was to shave five euros off the monthly stipends of France’s Aide personalisée au logement (APL), the country’s housing assistance program. Around the same time, he slashed France’s wealth tax on those with a net worth of at least €1.3 million—a holdover from the Mitterand era. This was the moment when a large percentage of the French public learned that in the eyes of their president, they had no value. “Ceux qui ne sont rien” is a phrase that has lingered and festered. To don the yellow vest is thus to declare not only that one has value but also that one exists. On the whole, the gilets jaunes are not the poorest members of French society, which is not surprising. As Tocqueville remarked, revolutions are fueled not by those who suffer the most, but by those whose economic status has been improving and who then experience a sudden and unexpected fall. So it seems with the gilets jaunes: most live above the poverty line but come from the precarious ranks of the lower middle class, a group that aspires to middle-class stability and seeks to secure it through palliative consumption: certain clothing brands, the latest iPhone, the newest television. In mid-December Le Monde profiled a young couple in the movement from Sens in north-central France, identified only as Arnaud and Jessica. Both twenty-six, they and their four children live in a housing project on the €2,700 per month that Arnaud earns as a truck driver, including more than €1,000 in government assistance. According to statistics from France’s Institut national de la statistique et des études économiques (Insée), this income places them right at the poverty line for a family of this size, and possibly even slightly below it. But the expenses Arnaud and Jessica told Le Mondethey struggled to pay included karate lessons for their oldest son and pet supplies for their dog. Jessica, who does not work, told Le Monde, “Children are so mean to each other if they wear lesser brands. I don’t want their friends to make fun of them.” She said she had traveled to Paris for gilet jaune protests on three separate weekends—journeys that presumably cost her money. The gilets jaunes have no substantive ideas: resentment does not an ideology make. They remain a combustible vacuum, and extremist agitators on the far right and the far left have sought to capitalize on their anger. Both Marine Le Pen of the recently renamed Rassemblement National and Jean-Luc Mélenchon of the left-wing La France Insoumise have tried hard to channel the movement’s grassroots energy into their own political parties, but the gilets jaunes have so far resisted these entreaties. The gilets jaunes also found themselves at the center of a diplomatic spat: in early February Italy’s deputy prime minister, Luigi Di Maio, met with two of their members on the outskirts of Paris in a jab at Macron. Two days later, France withdrew its ambassador to Rome for the first time since 1940, but the gilets jaunes have not attempted to exploit this attention for their own political gain. Instead there was infighting—a Twitter war over who had the right to represent the cause abroad and who did not. The intellectual void at the heart of an amorphous movement can easily fill with the hatred of an “other.” That may already be happening to the gilets jaunes. Although a careful analysis by Le Monde concluded that race and immigration were not major concerns in the two hundred most frequently shared messages on gilet jaune Facebook pages between the beginning of the movement and January 22, a number of gilets jauneshave been recorded on camera making anti-Semitic gestures, insulting a Holocaust survivor on the Paris metro, and saying that journalists “work for the Jews.” Importantly, the gilets jaunes have never collectively denounced any of these anti-Semitic incidents—a silence perhaps inevitable for a movement that eschews organization of any kind. 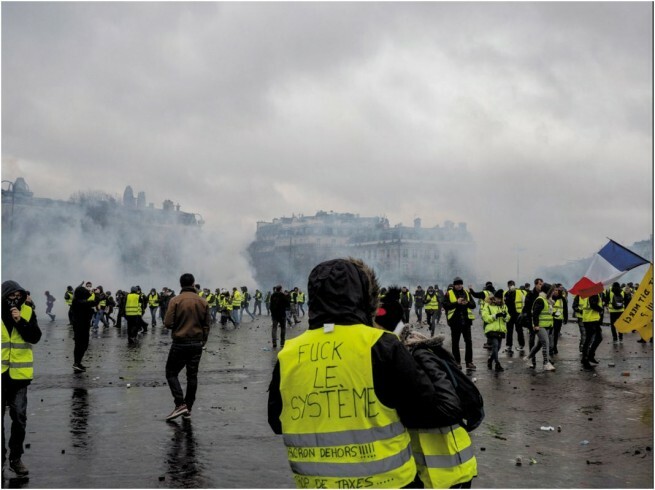 Likewise, a thorough study conducted by the Paris-based Fondation Jean Jaurès has shown the extent to which conspiracy theories are popular in the movement: 59 percent of those surveyed who had participated in a gilet jaune demonstration said they believed that France’s political elites were encouraging immigration in order to replace them, and 50 percent said they believed in a global “Zionist” conspiracy. The gilets jaunes are also distinctly a minority of the French population: in a country of 67 million, as many as 282,000 have demonstrated on a single day, and that figure has consistently fallen with each passing week, down to 41,500 during “Act 14” of the protest on February 16. On two different weekends in November and December, other marches in Paris—one for women’s rights, the other against climate change—drew far bigger crowds than the gilets jaunes did. But the concerns of this minority are treated as universal by politicians, the press, and even the movement’s sharpest critics. Especially after Trump and Brexit, lower-middle-class and working-class whites command public attention even when they have no clear message. French citizens of color have been protesting social inequality for years without receiving any such respect. In 2005 the killing of two minority youths by French police in the Paris suburb of Clichy-sous-Bois ignited a string of violent uprisings against police brutality, but the government declared an official state of emergency instead of launching a grand débat. In 2009, the overseas departments of Guadeloupe and Martinique saw a huge strike against the high cost of living—a forty-four-day uprising that also targeted fuel prices and demanded an increase to the minimum wage. In 2017 an almost identical protest occurred in French Guiana, another French overseas department, where residents demonstrated against household goods that were as much as 12 percent more expensive than they were in mainland France, despite a lower minimum wage. The French government was slow to respond in both of these instances, while the concerns of the gilets jaunes have resulted in a personal apology from the president and a slew of concessions. Guilluy, whose analysis of la France périphérique ultimately fails to grapple significantly with France’s decidedly peripheral overseas territories, does not shy away from the question of identity. He sees a racial element to the frustrations of la France périphérique, but he does not see this as a problem. Some of the most frustrating moments in his work come when he acknowledges but refuses to interrogate white working-class behavior that seems to be racially motivated. “Public housing in outlying communities is now a last resort for workers hoping to be able to go on living near the major cities,” he writes in Twilight of the Elites, describing the recent astronomic rise in France’s urban real estate prices. “These projects, mostly occupied by immigrant renters, are avoided by white French-born workers. Barring some utterly unforeseeable turn of events, their expulsion from the largest urban centers will be irreversible.” It would not diminish Guilluy’s broader point about la France périphérique if he acknowledged that victims of structural changes can also be intolerant. Whether the gilets jaunes will eventually come to agree with him is a crucial question. Like Guilluy, they are responding to real social conditions. But if, following Guilluy’s lead, they ultimately resort to the language of race and ethnicity to explain their suffering, they will have chosen to become a different movement altogether, one in which addressing inequality was never quite the point. In some ways, they have already crossed that line. Finkielkraut’s parents were Polish refugees from the Holocaust. He was born in Paris in 1949 and has become a fixture in French cultural life, a prolific author, a host of a popular weekly broadcast on France Culture, and a member of the Académie Française, the country’s most elite literary institution. In the words of Macron, who immediately responded to the attack, he “is not only an eminent man of letters but the symbol of what the Republic affords us all.” The irony is that Finkielkraut—another former leftist who believes that France has plunged into inexorable decline and ignored the dangers of multiculturalism—was one of the only Parisian intellectuals who had supported the gilets jaunes from the beginning. Although the Paris prosecutor has opened an investigation into his attackers, Finkielkraut has not pressed charges. He told me that the episode, as violent as it was, did not necessarily suggest that all those who had worn yellow vests in recent months were anti-Semites or extremists. “Those who insulted me were not the nurses, the shopkeepers, or the small business owners,” he said, noting that he doubted he would have experienced the same prejudice at the roundabouts, the traffic circles across the country where gilets jaunes protesters gathered every Saturday. In a sense, these were the essence of the movement, which was an inchoate mobilization against many things, but perhaps none so much as loneliness. The roundabouts quickly became impromptu piazzas and a means, however small, of reclaiming a spirit of community that disappeared long ago in so many French towns and villages. In Paris, where the remaining gilets jaunes have now focused most of their energy, the weekly protests have become little more than a despicable theater filled with scenes like the attack on Finkielkraut. There is no convincing evidence that those still wearing yellow vests are troubled by the presence of bigotry in their ranks. What is more, many gilets jaunes now seem to believe that pointing out such prejudice is somehow to become part of a government-backed conspiracy to turn public opinion against them. Consider, for instance, a February 19 communiqué released in response to the attack on Finkielkraut from La France en Colère, one of the movement’s main online bulletins. “For many days, the government and its friends in the national media seem to have found a new technique for destabilizing public opinion and discrediting the Gilets Jaunes movement,” it begins. “We denounce the accusations and the manipulations put in place by this government adept at fake news.” But this is all the communiqué denounces; it does not address the anti-Semitic violence to which Finkielkraut was subjected, nor does it apologize to a national figure who had defended the movement when few others of his prominence dared to do the same. A month after our last conversation, I called Priscillia Ludosky back, to see if she had any reaction to the recent turn of events in the movement her petition had launched. She was only interested in discussing what she called the French government’s “systematic abuse to manipulate public opinion.” She also believes that a government-media conspiracy will stop at nothing to smear the cause. “If there was one person who ever said something homophobic, it was on the front page of every newspaper,” she told me. 1 This phenomenon has been widely discussed in France since the publication of the journalist Olivier Razemon’sComment la France a tué ses villes? (Rue de l’Échiquier, 2016). No one has written more extensively on this question in English than my fellow correspondent Adam Nossiter. See especially his dispatch from Albi, “As France’s Towns Wither, Fears of a Decline in ‘Frenchness,’” The New York Times, February 28, 2017. 2 According to the annual 2018 report on poverty from Secours Catholique, a leading French charity, of the 8.8 million people living below the poverty line in France, the groups most affected were undocumented immigrants, single mothers, and elderly women. See “État de la pauvrété en France,” www.secours-catholique.org/sites/scinternet/files/publications/rs18-bd.pdf.